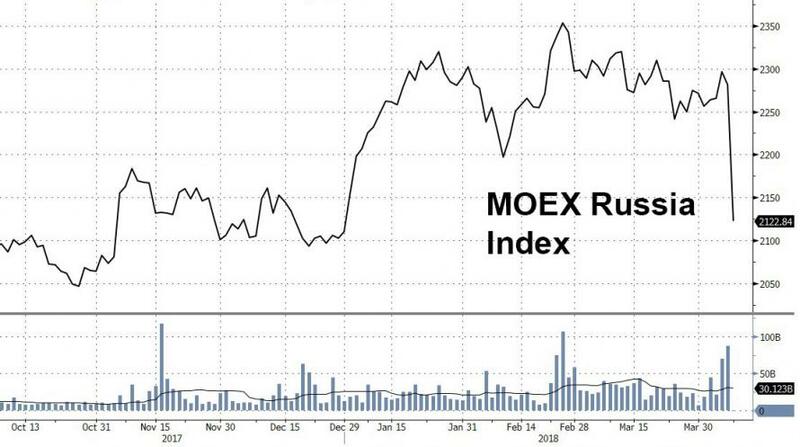 ... while Russian stocks as tracked by the benchmark MOEX Russia Index dropped as much as 7.2%, the biggest one day drop since March 2014, when the Russia-Ukraine proxy war spiraled out of control following the Russian anex of Crimea in response to the CIA-backed presidential coup in Ukraine. VTB Bank slumped as much as 12% after its Chairman Andrey Kostin was included in the U.S. sanctions list; Polyus declined as much as 15% after Suleiman Kerimov, whose son controls Polyus, was also sanctioned. 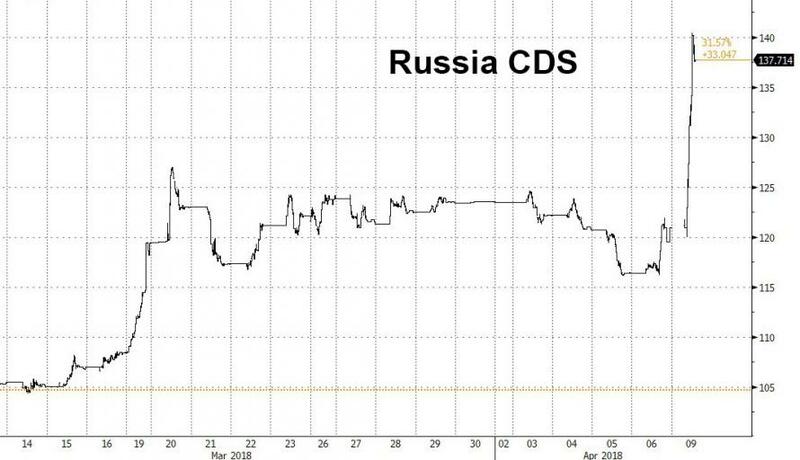 At the same time, Russian CDS climbed 17 bps, or 14%, set for the biggest jump since December 2014, while Russian ruble bonds maturing September 2031 fell for a second day, lifting the yield 18 bps to 7.39%, the highest since February, and the biggest one day drop since November 2016. The reason for the panicked scramble out of Russian assets is due to investor concerns penalties against Russia for "meddling in the 2016 election" while led the US Treasury to sanction dozens of Russian tycoons, key allies of President Vladimir Putin, and 15 companies some of which publicly traded, would led to a liquidity and/or solvency shock for Russian corporations. While the Friday news came in just before US payrolls, and at the time there was a modest reaction in markets, there now seems to have been a belated, and nasty reaction. The fallout from the sanctions will not be short lived, according to Citi. After all, Russia Prime Minister Medvedev has ordered the government to take steps to help sanctioned companies, as well as noting that Russia has the right to respond to the US sanctions. Any retaliation may signal a deterioration of US-Russia relations, depending on what action Russia decides to take in response. This comes amid an attack on a Syrian airbase, which the Russia defense ministry says was Israel that fired it. This countered speculation that it may have been the US, after Trump tweeted that there is a "big price to pay" for the reported chemical attack at the weekend. As Citi adds, market participants are understandably taking out positioning in RUB assets in such an environment: "Our eTrading desk notes that interbank trading volumes are nearly three times the 30d average. However a number of stop runs seem to have been accelerated this move. This is the biggest one day move we have seen in a while. USDRUB seems hesitant to test the 60 handle, although the pair is up almost 3% on the day. The November 2017 high comes to mind at 60.45 and then, the June 2017 high at 60.99." But the big action was on the Russian stock market, where shares plunged in billionaire Oleg Deripaska’s aluminum giant Rusal and Viktor Vekselberg’s energy holding En+. 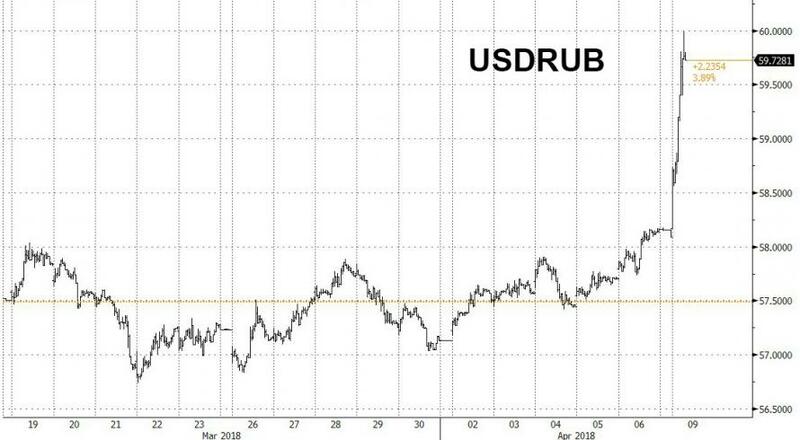 Of note: Rusal asked its customers to stop payments after it was placed under U.S. sanctions. The world's second largest aluminum company by production output was investigating the consequences of the sanctions and doesn’t waive its right to the payments, according to a copy of a letter dated April 6 and signed by Rusal’s head of marketing, Bloomberg reported. "We request that you immediately withhold all payments and remittances to UC Rusal until further notice,” the company said in the letter. "We are working intensively to ensure continuty of our business." Rusal shares fell 50% to HK$2.32 on Monday, according to pricing from the Hong Kong Exchanges & Clearing . website, amid fears the company will file for bankruptcy having been isolated from global funding. Shares dropped about 47% in Moscow before recovering about half the drop. “Investors finally realized how badly things are turning out for Russia,” said Vadim Bit-Avragim, a money manager at Kapital Asset Management LLC in Moscow, who’s selling Russian shares today. “It seems like the U.S. has had enough. Foreign investors have to exit sanctioned companies, but they saw this order as a signal to exit all Russian stocks. Investors are afraid that now any Russian company is at risk of sanctions. Traders are closing limits on Russian shares because they’re seen as toxic assets." A question many investors are asking on Monday morning is whether China will step up and provide "last-resort" liquidity as Russia once again finds itself isolated from Western funding source.